On April 12, 1961, Yuri Gagarin became the First Man in Space with the Soviet Union’s Vostok spacecraft circled the Earth for a little more than one orbit. His flight lasted 108 minutes and the world rejoice as the space age era began. 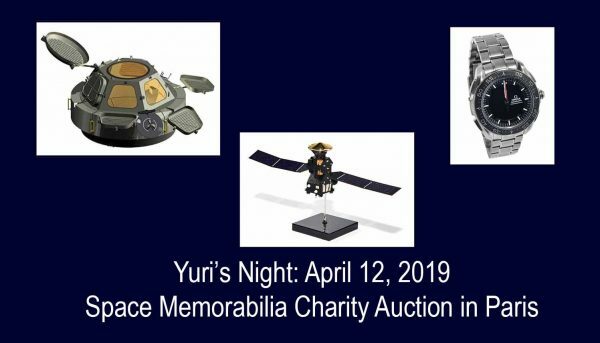 On the occasion of Yuri’s Night, Friday, 12 April 2019 at 19.00, the ‘Spacebrains’ foundation has directed Artcurial to sell a set of 16 lots related to the European space adventure, gathered by the European Space Agency (ESA), with most items having flown on space missions. This is an unusual way to celebrate the 58th anniversary of Gagarin’s Vostok 1 mission, the first flight of a human in space, because this will be a new opportunity to acquire items with the heritage of international space missions. The sale is organized at Artcurial auction house in Paris. The countdown has begun! SPACEBRAINS is a new initiative supported by ESA, a non-profit association created in August 2018 with a new approach, aiming to be the beacon that monetizes such wealth to offer a unique opportunity for daring ideas that link space to disruptive technologies. For this first auction, 16 lots of a wide range of items are presented, each unique and accessible only in the context of this sale: be it a space stamp franked on board the Mir space station, flown space patches, one of Ariane 5’s booster bolts recovered from the Atlantic Ocean, the full scale model of Cupola (the European-built panorama window module installed on the International space station), one of the five flown OMEGA Speedmaster X33 Skywalker watches, or your own official manufacturer’s Exomars spacecraft model. The auction will be preceded by a public exhibition from 30 March to 9 April at Artcurial. It has logged 206 days in space including 202 on board the ISS. Grade 2 titanium, 45 mm diameter with black dial, LCD screen, bidirectional rotating black ceramic bezel, ray-resistant sapphire crystal, double-sided anti-reflective coating, water resistan to 3 bars (30 m/100ft), titanium bracelet grade 2 5. 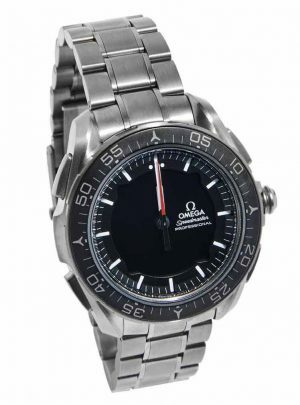 The OMEGA SPEEDMASTER SKYWALKER X-33 is equipped with the OMEGA 5619 calibre multifunction quartz chronograph with thermal compensation, as well as special functions invented by a European astronaut, developed by OMEGA, then tested and qualified by the European Space Agency (ESA). The dual display (analogue and digital) of this model, offers among other functions: three time zones, a chronograph, a countdown, the functions Mission Elapsed Time (MET) and PET (Phase Elapsed Time), three alarms and one perpetual calendar. Inscription on the back ‘TESTED AND CERTIFIED BY ESA’. Only the first 100 copies remain with this inscription, which has since been replaced by ‘TESTED AND QUALIFIED’. This watch travelled to the ISS on the Japanese freighter HTV-6 (launched on 9 December 2016), stayed on the International Space Station during ESA astronaut Thomas Pesquet’s Proxima mission and returned to Earth on the SpaceX Dragon CRS-11, on 3 July 2017, shortly after the return of Pesquet. The watch is sold with its presentation box, offered by OMEGA. The European-built Cupola provides an observation and work area for the International Space Station crews, giving visibility to support the control of the Station’s robotic arms and a beautiful view of Earth, celestial objects and visiting vehicles. It features six trapezoidal side windows and a circular top window 80 cm in diameter, making it the largest window ever flown in space. Each window uses advanced technologies to protect the sensitive fused silica glass panes from years of exposure to solar radiation and debris impacts. The windows are protected by external shutters, which can be opened by the crew inside. Afterwards, the shutters are closed to protect the glass from micrometeoroids and orbital debris, and to prevent solar radiation from heating up Cupola or to avoid losing heat to space. Each window has three subsections: an inner scratch pane to protect the pressure panes from damage inside Cupola; two 25 mm-thick pressure panes to maintain cabin pressure (the outer pane is a back-up for the inner pane); and a debris pane on the outside to protect the pressure panes from space debris when the shutters are open. This model has been designed to be statically exposed, protected from the elements and reflects the general structure of the panorama window. 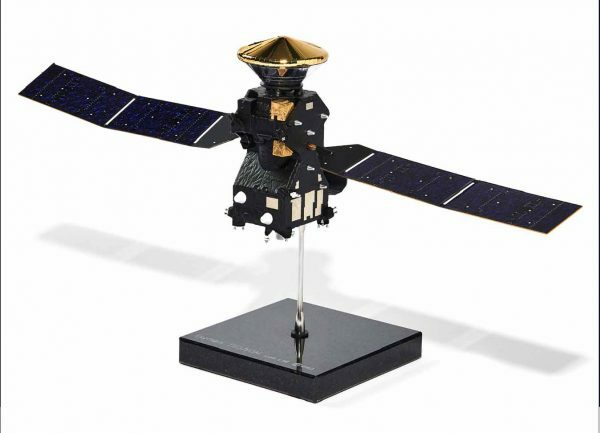 Metal, mounted on a black marble base with the inscription ‘ExoMars TGO / EDM scale 1/50 ESA’ Height: 18 cm. Length: 35 cm. 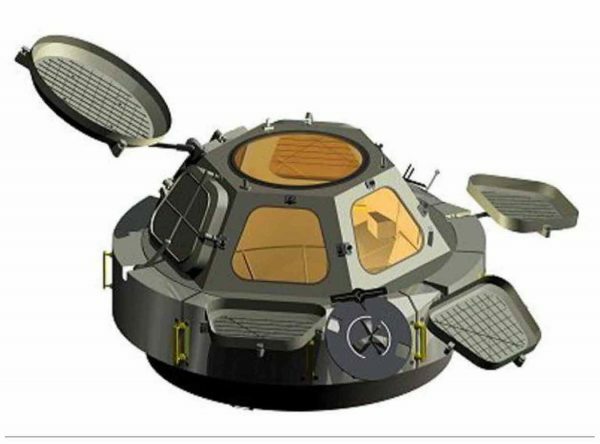 The 2016 ExoMars Trace Gas Orbiter (TGO) is the first in a series of Mars missions to be undertaken jointly by the two space agencies, ESA and Roscosmos (Russian space agency). The ExoMars 2016 mission was launched on a four-stage Proton-M/Breeze-M rocket, provided by Roscosmos, from Baikonur on 14 March 2016. In the first six weeks following launch, the spacecraft was commissioned, this is when all the systems and instruments are checked out and verified. Then it entered the cruise phase. Mars: a very large engine burn that changed its direction and speed to intersect the Red Planet on 19 October 2016.